Despite continued calls for railroad safety, railroad workers continue to perform their jobs in often dangerous conditions. These conditions frequently result in serious injuries to workers and even more tragically, their deaths. Last year alone, there were more than 25 railroad workers killed while on the job. Whenever a railroad employee is injured, any compensation is covered under the Federal Employers Liability Act (FELA). FELA was enacted in 1908 to provide railroad workers and their families federal protection and process for legal recovery in the event of injury or death. Although FELA offers protections to railroad workers that are similar to workers’ compensation insurance, which protects and provides injured workers in other industries, there is a major difference when it comes to liability. Unlike workers’ compensation, which does not require an injured worker to prove the employer is liable for their injury, FELA is based on a fault-based system. This means an injured railroad worker must prove that their injury was caused due to the negligence on the part of the railroad. However, FELA does allow an injured railroad worker to sue the railroad for damages, which is something someone covered under workers’ compensation cannot. When a railroad worker dies from their injuries sustained on the job, their family or estate representative can file a lawsuit under FELA to recover damages. The party filing the lawsuit is a personal representative of the decedent, which can be a spouse or close family member although others can serve in that capacity. Please note, the statute of limitations for filing this claim is only three years from the date of injury or death, so it is critical to contact a Virginia FELA attorney as soon as possible. The exact date will be determined by the type of injury the victim suffered. When the death was caused by sudden trauma, the three-year date is evident, but when the death was caused by a slow-developing injury, such as an asbestos-related illness, it can be much more complex to determine the three-year period. Your attorney will be able to make that determination for you. The medical, funeral, and burial expenses the family incurred as a result of the victim’s death. The pecuniary (financial losses) the family will suffer as a result of the victim’s death. This can include lost future wages, benefits, and services the victim would have provided for his or her family had they survived. Some of the different services the victim provided their family which can be included in a FELA wrongful death lawsuit can include childcare, household duties (i.e. landscaping, home maintenance, etc. ), and any other activities the victim provided the family which they will now have to pay someone to perform. The pain and suffering the victim experienced from their injuries before they died, including psychological injuries in fear of impending death and conscious pain and suffering. Unfortunately, the Federal Employers Liability Act differs from typical state wrongful death statute by prohibiting recovery of grief, loss of consortium, and loss of companionship to the surviving spouse or close family members. In many cases that involve the tragic death of a railroad employee, the railroad may contact the victim’s family to try to offer a quick settlement. The amounts they offer are usually far below the actual amount the family would recover with the help of a FELA wrongful death attorney. Families should never sign or agree to any settlement without first consulting with a Virginia FELA attorney. At Shapiro & Appleton, we have extensive legal experience advocating for railroad workers and their families. If your loved one has been killed in a railroad accident, call our firm today to find out how we can help your family get the legal and financial justice you deserve. A jury in Tyler, Texas awarded more than $8 million to a truck driver from East Texas who suffered serious injuries in a railroad accident in May 2015. The truck driver was injured while he was unloading a feed truck into a train car at a trans-loading facility in Mt. Vernon, Texas. The railroad conductor told the truck driver to get on the top of the train car, but he then moved the car without telling the truck driver. He fell more than 15 feet and suffered serious personal injuries that left him without the ability to work. The key moment in the personal injury lawsuit came when the conductor provided contradictory testimony regarding the accident. The man who was injured told the media that he was relieved that he had been compensated for his injuries so that he could begin the healing process. Our railroad injury and personal injury attorneys in Virginia are pleased that this injured truck driver received ample compensation for his railroad accident injuries. In the type of railroad work accident described, it is very important that the railroad conductor and the truck driver communicate clearly to avoid a serious accident. Because that did not happen, the truck driver is now dealing with life-changing personal injuries. Have a safety and wellness plan. This is the foundation for a safe workplace. The program should cover all aspects of employee safety and health. The above case could have been avoided if there was a protocol in place to prevent the train car from being moved when someone was on top of it. Educate staff. It is important to constantly cultivate a culture of safety with employees and management. There should be regular training about the importance of following safety procedures to prevent personal injuries and lawsuits. Study safety vulnerabilities. Every business and industry are unique, so you should ensure that you study the ways that accidents can happen in your specific workplace. That way you can avoid them. If you were injured in a workplace or other type of accident, you may be able to receive compensation if someone acted negligently, as in this $130,000 neck injury settlement we handled a few years ago. After a five day trial in St. Francois County, Missouri, the jury awarded $4.4 million to an injured BNSF Railway worker. According to the lawsuit documents, Rob Hays from Raymore MO was working for BNSF operating a weld truck with a rail replacement crew along the Mississippi River north of Ste. Genevieve. He was driving the truck with a remote control device while standing on a platform on the truck’s side. Rocks from a bluff near the tracks had fallen and were piled up next to the tracks, which is a violation of the clearance standards of the railroad. They struck the bottom of his platform and he was knocked off and dragged on the tracks. He suffered a broken pelvis and hip and had to have part of the small intestine removed. The man no longer can do the heavy work of his old job but he can currently do office work. The railroad stated that the worker was at fault, but the jury found BNSF 100% at fault. They also found that the railroad had broken a rule by the Federal Railroad Administration that mandates handrails on the platform. Our railroad injury attorneys frequently represent workers who have been hurt on the job. It is hardly uncommon for the railroad to deny responsibility for the worker’s injuries. It usually takes the expertise of experienced and aggressive FELA attorneys to get the worker the compensation he deserves. We had a railroad worker client who suffered serious back injuries when his foot fell into a depression in the ballast rock along railroad tracks he was walking beside. Our legal team was able to show that the track was improperly constructed, which led to the railroad ties creating small voids in the ballast rock profile. The railroad claimed it did not know about this problem but our lawyers were able to settle this tough case for $900,000. A railroad conductor in Harrisburg PA has sued Delaware and Hudson Railway Company for what he claims are repetitive stress injuries that are allegedly due to his employer’s negligence and failure to provide a safe work environment. The complaint alleges that the former conductor suffered repetitive trauma to his arms and legs by working in an environment that included large mainline railroad ballast rock that shifts underfoot constantly. Because of this, he claims that he will have to suffer with this medical condition for years, which is impairing his ability to work. He is seeking a trial by jury and is seeking more than $150,000. As experienced FELA attorneys in Virginia, we know that repetitive stress and sudden injuries are extremely common in railroad-related jobs. We had a railroad conductor client who was injured in 2003 while he was walking along his mile-long freight train checking the air brakes. His foot fell into a depression in the ballast rock. He twisted and suffered a major back injury. He had major back surgery in 2005 but he still had considerable pain that left him unable to work. His doctors eventually did fusion surgery on his lower back, which left him completely disabled at 37 years of age. Our law firm carefully studied the accident scene and hired a hydro-geologist to review how water flowed through that area. We also hired a railroad track structure expert to review that section of track. The railroading expert discovered that there were little pieces of wooden crosstie mixed into the ballast rock in the area where the fall happened. He reported that this was improper track construction; the ties can create gaps in the ballast rock. As the wood breaks down, it leaves small holes or voids in the rock. The bottom line: We achieved a $900,000 in this railroad personal injury case. If you are injured on the job at a railroad, please review our guide A Railroad Worker’s Rights When Injured on the Job. 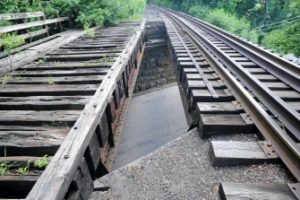 Our railroad injury lawyers have decades of jury trial courtroom experience and handle railroad injury cases east of the Mississippi river, so essentially anywhere in the eastern United States. CSX alleges that a former railroad worker failed to sign and return a settlement agreement, thus the railroad is seeking to strike the settlement and dismiss the complaint entirely. On Dec. 23, Judge Mary Doherty in Philadelphia moved to dismiss a case brought by Mark Christopher from Union KY, against CSX Transportation based in Richmond VA. The judge’s dismissal is based upon the worker’s alleged ignoring of a court order from Aug. 27, 2015. Philadelphia County Court of Common Pleas records stated that a settlement was reached in Christopher’s personal injury law suit in August 2011. However, the judge stated that the former CSX employee did not execute and return the final settlement release. This forced CSX to file a motion to enforce the settlement. Another judge granted the settlement enforcement motion in August, and ordered Christopher to execute and return the final settlement release within 30 days. In early October, plaintiff counsel promised that his client would sign and return the settlement release immediately. However, the release was never signed or submitted. The original lawsuit alleges that in his work with CSX from 1978 until 2009, he was exposed to excessive, cumulative trauma to his knees. This was largely due to having to bend, crawl, kneel, squat, climb and walk on unleveled ballast. Less than three years before he filed the suit in 2009, the man found that he had suffered a right knee injury from repetitive trauma. The suit alleged that CSX did not provide a safe work environment. The plaintiff sought damages of $50,000 in this workplace injury case. Many of our personal injury law firm’s clients in Virginia come to us because they suffered injuries due to repetitive heavy lifting or repetitive work tasks that cause permanent injuries to their joints. We have seen in many workplace injury cases at railroads where improper ergonomics lead to serious injuries over long periods of time. Proper ergonomics in the workplace involves preventing repetitive workplace injuries by changing how the work tasks are done. Changing how the task is done is called an administrative change, while changing the tool or equipment is called an engineering change. Oftentimes a railroad worker will contact our personal injury law office in Virginia Beach and tell us that their doctor stated that their injury was caused by their work at the railroad. However, the railroad is NOT liable to pay them compensation unless the railroad can be proven to have been careless or negligent in not preventing repetitive stress injuries. This is where an experienced attorney who understands ergonomics and reasonable prevention of repetitive stress injuries is so important. In some workplace injury cases, we have brought in an ergonomist who is able to show their his or her expertise that the railroad was indeed negligent, which led to a worker’s injury. Note that claims against railroads fall under the Federal Employers Liability Act, which has a three year statute of limitations from when the claim arises. The last thing we will say about this workplace injury case is that a good FELA attorney would make absolutely certain that the client signs and files all required paperwork to settle the case.